PC Schembri, centre, with Home Affairs Minister Michael Farrugia, left, and Police Commissioner Lawrence Cutajar. Police officer of the year Simon Schembri is being promoted to sergeant on January 21. The 48-year-old traffic policeman lost an arm last year when he was dragged several metres under a car in a hit-and-run after he tried to stop 17-year-old Liam Debono, who was over-speeding in a Mercedes. The youth stands charged with attempted murder and is out on bail after pleading not guilty to the charges. The officer was nominated policeman of the year by his peers. 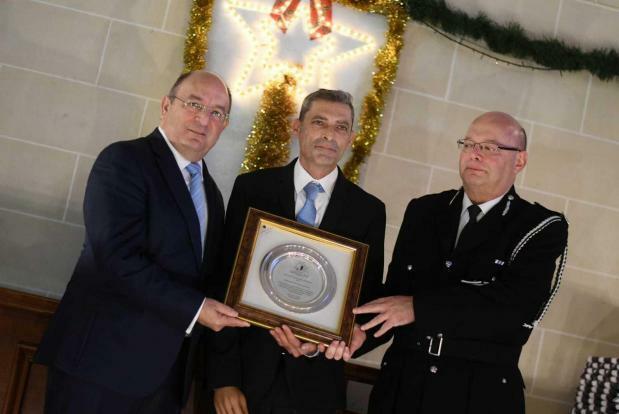 The Simon Schembri Blue Light Foundation said on its Facebook back PC Schembri distinguished himself impeccably throughout his policing years and was “a living example of a person having a glorious career without climbing up to the highest ranks of a Department”. The foundation was set up after the incident to give psychological and financial support to members of disciplined forces and raise awareness on the perils these officers faced on a regular basis while on duty.